Hadrian decree: "The Wall shall be rebuilt"
Map of Hadrian’s Wall - click any red square to go to that fort page. Wall and major Roman forts and roads are shown. Presumed roads are detailed as dotted lines. The Stanegate is presumed to have started at Corbridge and run west to at least Vindolanda creating the first Roman defensive line in Britain although its initial purpose was that of a strategic road. The line of the Wall is shown in red. Often the buildings would match the ego of the ruler but with Hadrian’s Wall it was slightly different. There was a given purpose to its conception, design and ultimate build. Three legions had to be taken from their forts around the country and relocated for the period of the build and could only be undertaken if there was relative quiet in Britannia. 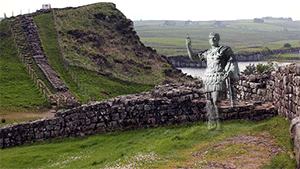 So, what was Hadrian’s Wall and why was it built? Who were the soldiers constructing and constantly repairing it? What was it used for? Was it simply a barrier to keep out the barbarians to the north? Was it a customs point? What did the Wall look like to those so-called barbarians and did they ever attack it? How many forts, milecastles and turrets lined its length from Segedunum in the east to Maia in the west? Who manned the Wall? What other defensive barriers aided the army along the Wall in its aim to protect this small part of the Empire? How did they supply the army? Although we do have some spectacular sites along the Wall there are areas where virtually nothing remains unfortunately. Large areas remain to be excavated in years to come but this will be done with due consideration to the future of the Wall and local populations living around it. Future generations who may excavate with a far better understanding of the methods used to carry out research and one day, you, the visitor to this site may just make that personal trek to the monument if you have not already done so and, like me, may even be inspired to research its history in greater depth. Many wonderful memories can be made along its stretches and the views are often very spectacular... enjoy. There is also a possiblity that the Wall was built because of severe losses to the Roman Legions in the north shortly before Hadrian visited Britain and ordered the building of the Wall. Stanwix (Uxelodunum) fort was where the Ala Petriana cavalry unit was based and was the most important fort along the Wall. The legendary loss of the Ninth Legion is quite possibly true and could well have taken place just north of the Stanegate and this fort and into the Scottish borders where a large ambush could well have overwhelmed the legion. It is perfectly conceivable that this is one of the main reasons Hadrian was forced to visit the country and head off further incursions into Roman territory and thus the concept of a strong barrier was born. On the berm (the flat land on the north side of the Wall) there is a defensive barrier known now as the cippi defences. Three lines of posts or steaks closely piled into the ground, angled away from the fort with sharp thorn bushes wrapped around the posts, and sharpened at the top to form spikes, would have formed a barrier effective enough to at least repel any quick attack on the Wall. Hadrian’s Wall... the northern-most boundary of the once proud Roman Empire. An Empire that lasted over one thousand years and remains foremost in our historical records for its uniqueness, grandeur, military, civilian and political landscapes. An Empire that had it all and in its own indomitable style and greed was to be the cause of its own downfall. We have countless remnants of the Empire all across the Roman world, still intact in some places, which give us a huge understanding of its history. But none more so in terms of size and epic proportions than Hadrian’s Wall itself. It sits across the whole length of northern Britain in some areas of outstanding natural beauty. (Hadrianus) murumque per octoginta milia passuum primus duxit, qui barbaros Romanosque divideret. 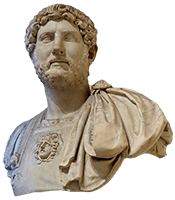 (Hadrian) was the first to build a wall, eighty miles long, to seperate the Romans from the barbarians.